We enjoy eating fish, any variety, but I usually prepare it very simply and then fancy up the side dishes to make an interesting plate. Most of the fish we eat are heftier ones that lend themselves to grilling in summer and broiling in winter. Others, such as cod or halibut, I typically bake. Only fillets of lighter white fish, such as flounder, sole, or tilapia, are cooked on my stovetop. 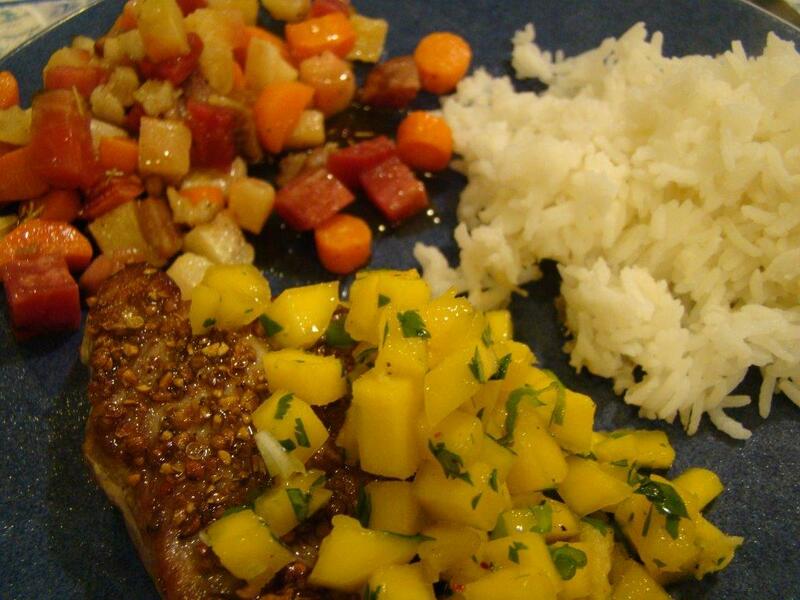 This week’s recipe for spice-crusted tuna pushed me to mix up and cross over my known boundaries. That’s part of what French Fridays with Dorie is all about, right? I’ve discovered that frozen ahi tuna steaks are a regularly-stocked item at Trader Joe’s, so I only had to plan ahead for thawing. 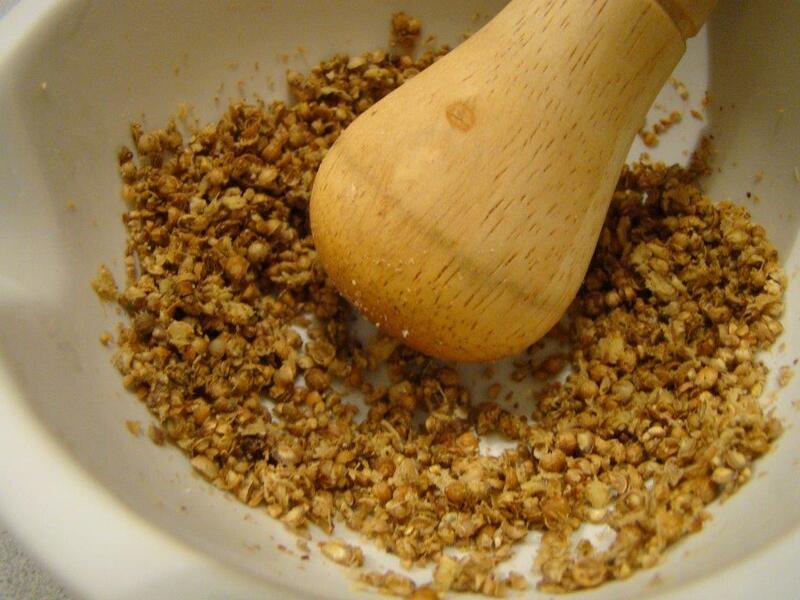 Fragrant spices are pounded with a mortar and pestle (so satisfying) to coarsely crush the peppercorns, cardamom and coriander seeds and turn the fresh ginger into a paste to loosely glue it all together. 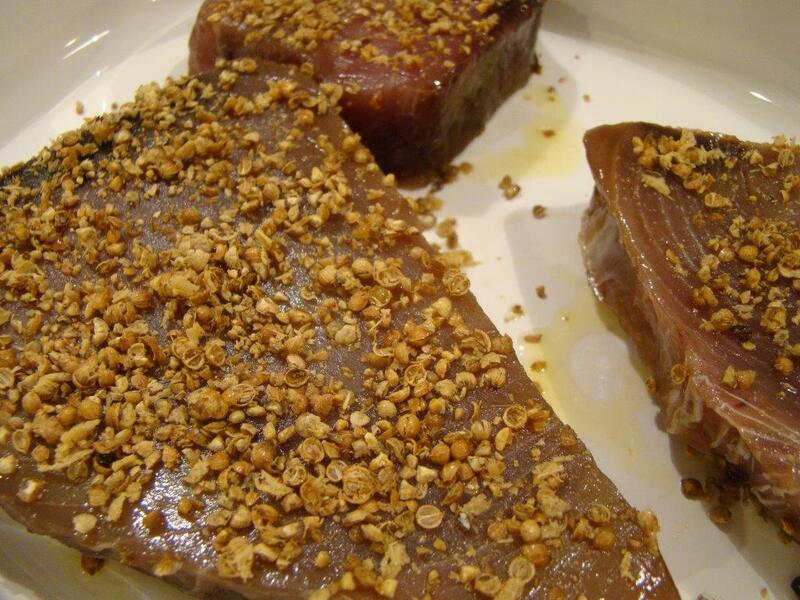 The tuna is lightly rubbed with oil, coated in the spice mixture, and seared in a hot skillet. The whole process from pantry to plate takes less than 10 minutes. The mango chatini was a little more time-consuming because it involved a lot of chopping. It was not onerous, and it was definitely worth it. The chatini is like a salsa. 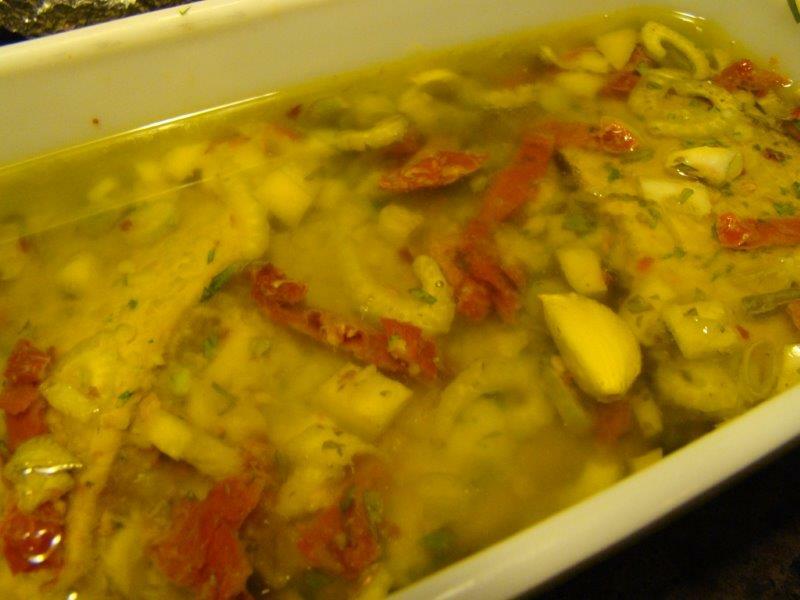 In fact, it is very similar to the mango guacamole that Howard makes when Champagne or Ataulfo mangos are in season. His concoction includes avocado, which would have been at home in this chatini, and doesn’t use any ginger. Otherwise, they’re pretty much the same. The chatini was the perfect topping/garnish for the spice-crusted tuna. I really liked the way the ginger flavors in both the chatini and the spice crust pulled the meal together. We ate the leftover chatini with tortilla chips, just like we do with guacamole. Tuna is one fish that I’ve only cooked at home for French Fridays. I really enjoyed the spiced crust in this recipe. Even though I was the one who prepared it, the flavors popping in my mouth still surprised me. However, as much as I do like tuna, honestly, I prefer it as sushi (or canned, which is its own thing) rather than cooked. I invite you to check out my friend Lisa’s new blog Hawley’s Food Path. Lisa is my (in-person) friend who I met at a Nantucket basket weaving class at least a decade ago. We also belong to the same local garden club. Lisa loves to cook, and recently, we were talking about French Fridays. She was inspired to order the book, create a blog, and jump in with us this week. She’s really excited. Please visit her blog and give her a warm welcome to our group! I know you’ll enjoy her warmth and humor as much as I do. To see how the other Doristas’ tuna came out, check out their links here. We don’t post the recipes, but you can find it in Dorie Greenspan’s book Around My French Table. 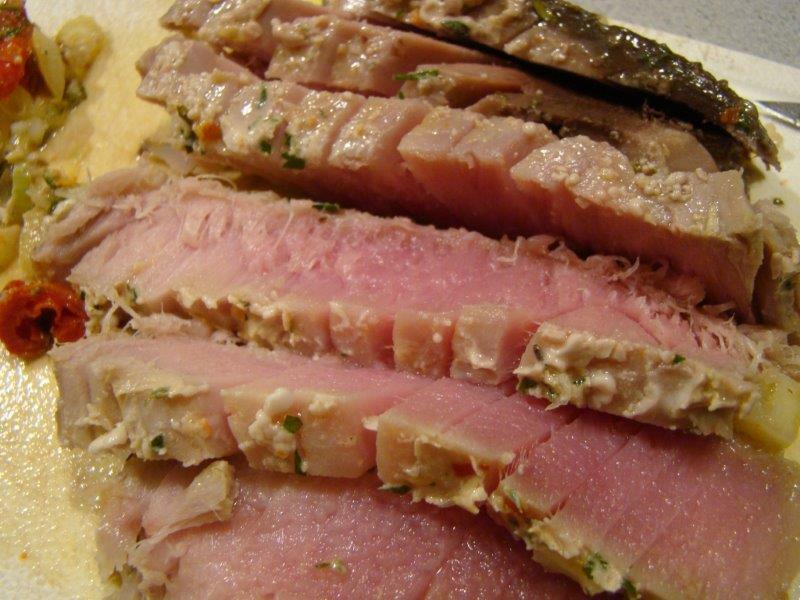 Confit is an ancient French preparation for cooking and then preserving meat in its own fat. This is classically done with duck (a favorite at my house) and sometimes pork. This week’s recipe for French Fridays with Dorie was something more modern, but in the same spirit: Tuna Confit. In the case of the tuna, which doesn’t really have any fat that would render during cooking, it is mixed with a variety of aromatic seasonings, then covered in olive oil. First, the tuna marinates in this oil bath for the day, then spends an hour in the oven at a very low temperature, before being sliced and served with a summery tomato salsa and some olive tapenade. Over the weekend, I scoped out availability and price of tuna. Whole Foods had it, at $25/pound. I wasn’t planning to make the tuna until later in the week, so I thought I’d come back later in the week. I also decided that at that price, I’d make a half batch. On Tuesday, I went back to Whole Foods, but they were out of tuna, and didn’t expect more until Friday. Ugh. I stopped at another store with a decent fish counter, but they didn’t have any either. As a last try, I checked at Trader Joe’s. Though I don’t usually buy it, I remembered they carried frozen fish. Well, the stars aligned in my favor. Not only were there ahi tuna steaks in the freezer, but they were only $9/pound. The packages were about a pound, so a full batch it would be. Whenever a recipe calls for preserved lemon, as the tuna confit does, I always make a batch of Mark Bittman’s quick preserved lemons, which takes only 3 hours, no more advanced planning than that required. 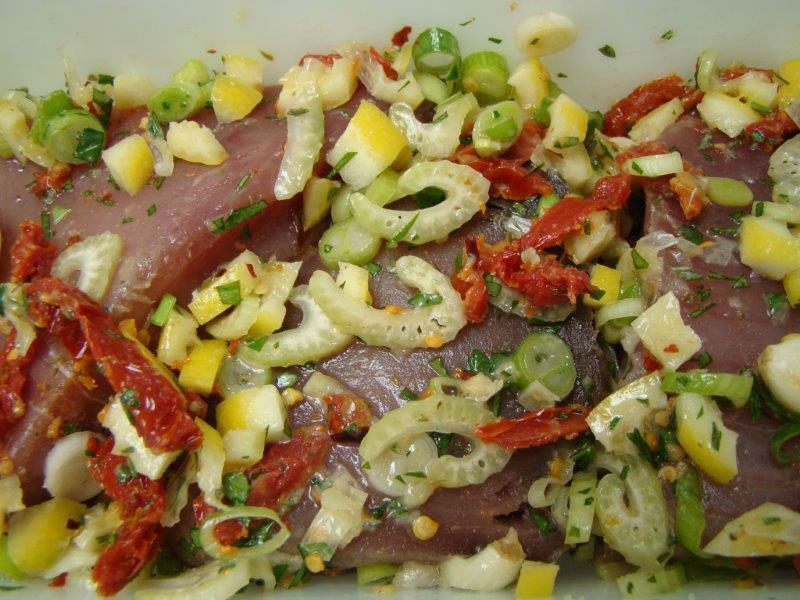 In addition to preserved lemon, the tuna is flavored with fresh lemon (juice and zest), sun-dried tomatoes, scallions, garlic, celery, and fresh herbs. Besides smelling extremely fragrant, I loved how colorful the mixture was. The colorful theme continued with the tomato salsa that tops the tuna. Chopped cherry tomatoes, fresh from my garden, along with diced pepper (both fresh and pickled) and more preserved lemon. I’ve been trying to avoid using the word “confetti” because I overused it a few weeks back, however, it’s the perfect word, so I have to use it to describe how the salsa looked. I served slices of the warm and rosy tuna, topped with the cooking mixture, the tomato salsa, and a dab of (green) olive tapenade with some leftover Swiss chard ravioli on the side. Delicious! Even better was night #2 when I used the tuna as the star of a salad Niçoise. I tossed lettuce and cherry tomatoes with a light mustardy vinaigrette for the bed for the salad. 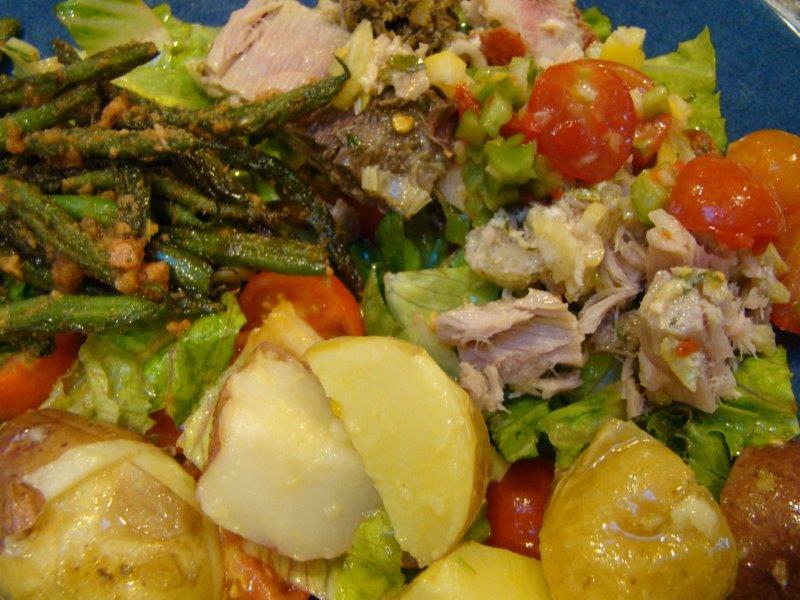 Then, I topped this base with steamed potatoes chunks tossed with the same dressing, slices of cold tuna confit with leftover tomato salsa and tapenade spooned on top, and these unusual green beans tossed with a chorizo dressing (sort of like a meaty Romesco sauce). The final composition made a fabulous dinner. Some of you might groan, but I didn’t like it quite as much as Salmon in a Jar. Head-to-head, it would be a close contest. Used as an ingredient, there are so many possibilities for what to do with the tuna confit that the gears in my brain are turning. Howard wants to give this a whirl with one of us sous-vide devices. I suspect we’ll be making this one again. If you want to try this yourself, check out the recipe (in two parts) at the Washington Post (part 1 and part 2). Of course, you can always find it in Dorie Greenspan’s book Around My French Table. 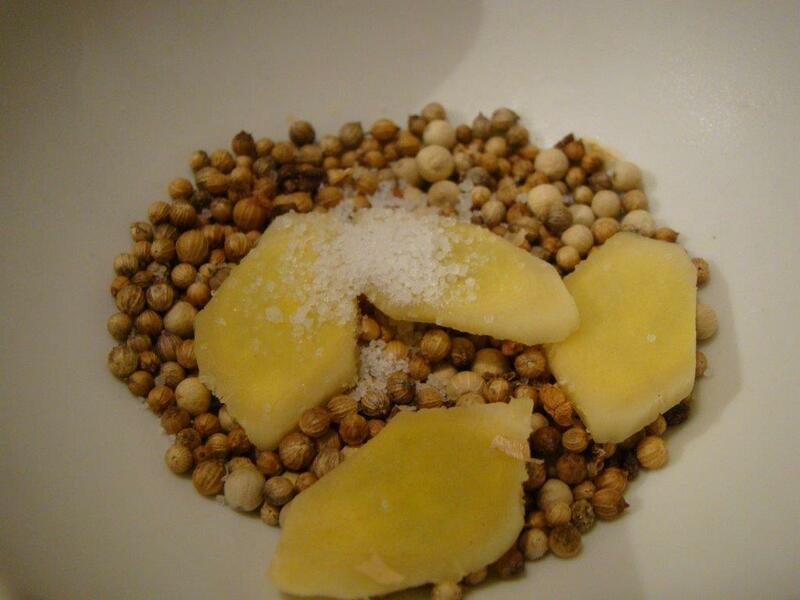 To see what the other Doristas thought about tuna confit, follow their links here.